Hot Stone Hot stone massage is a specialty massage where the therapist uses smooth, heated stones, either as an extension of their own hands, or by placing them on the body while they massage other parts of the body. 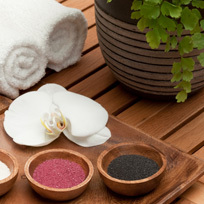 Hot Salt Hot Salt Massage is an innovative healing technique using warm salt crystal stones to ground and balance the body’s electromagnetic field, central nervous system and meridians. Aromatherapy Essential oils can affect almost every organ system in the body. 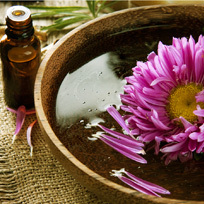 Each essential oil has a unique pharmacological effect, such as anti-bacterial, tranquilizing, and adrenal stimulating. 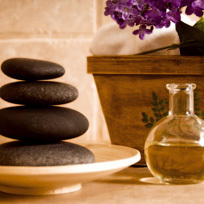 Massage Massage therapy is a relaxing treatment that has been around for thousands of years. 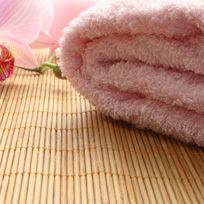 Many people consider massage therapy to be just about pampering, but it has important health benefits.